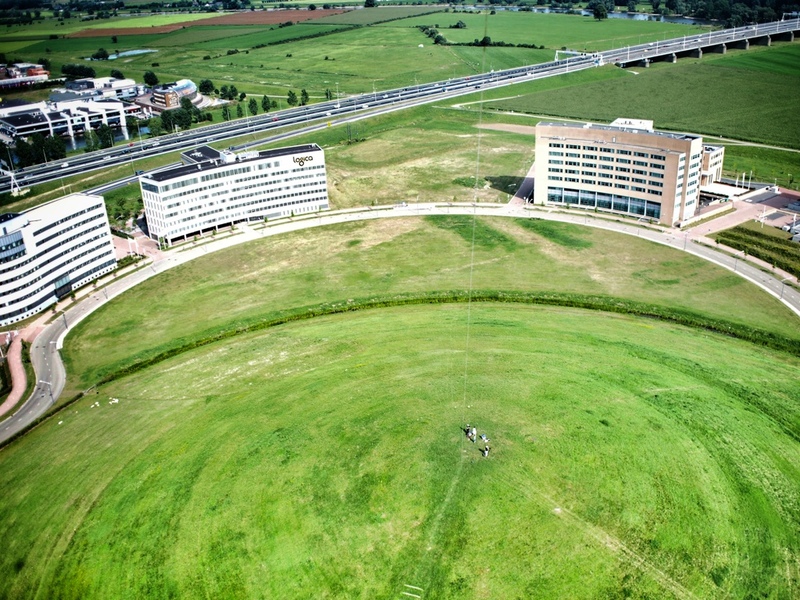 KAP (Kite Aerial Photography) | JokerXL goes sky-high with a camera strapped to a kite. 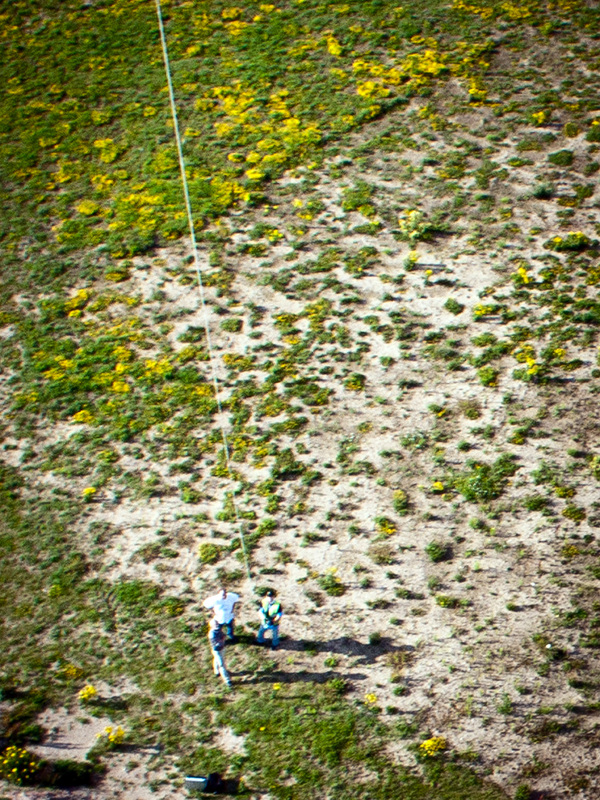 JokerXL goes sky-high with a camera strapped to a kite. Hey! Long time – no see! Hoek van Holland, the wrong way. Just around the corner from our house . . . .
Back in the land of Holl. WP doesn’t allow uploading of video any more for some reason. Let’s see if that works! Ok, it’s been a while, I know. Things to do people to see. I apologise for my absence. 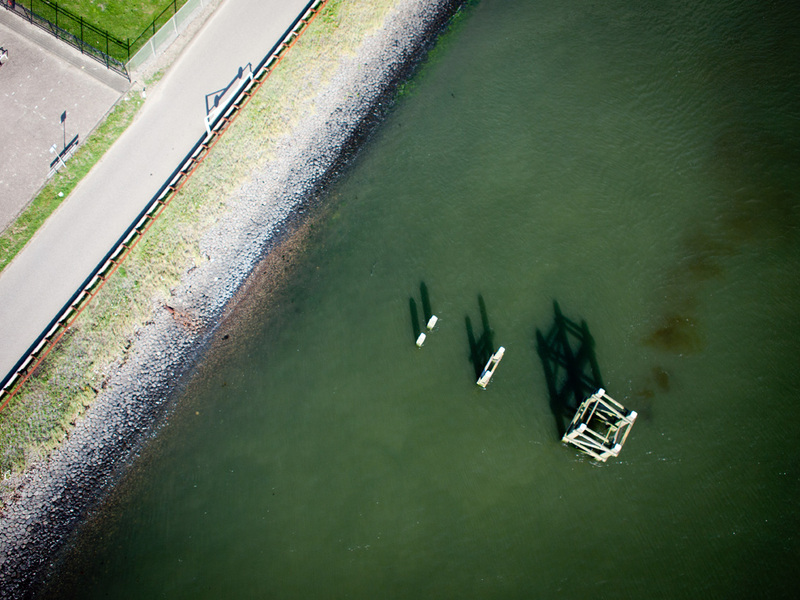 But yes, I have been out and about in the mean-time with the kite and camera. Just last week, for instance, on a blustery summer’s day in the land of Holl. 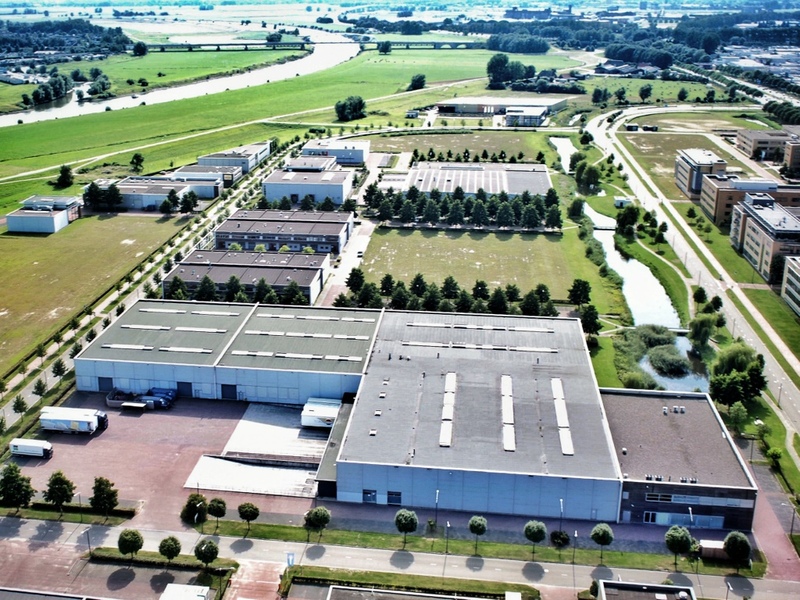 This big lump of earth on an industrial estate just outside of Arnhem provides a great kiting platform. 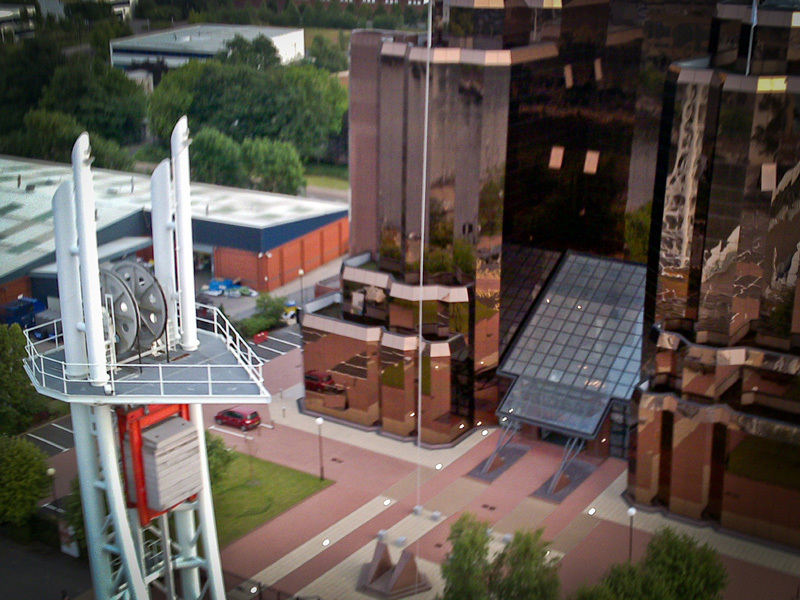 This is the view 180 degrees the other direction, it’s the Bunzl warehouse and offices, where my partner Anja works. 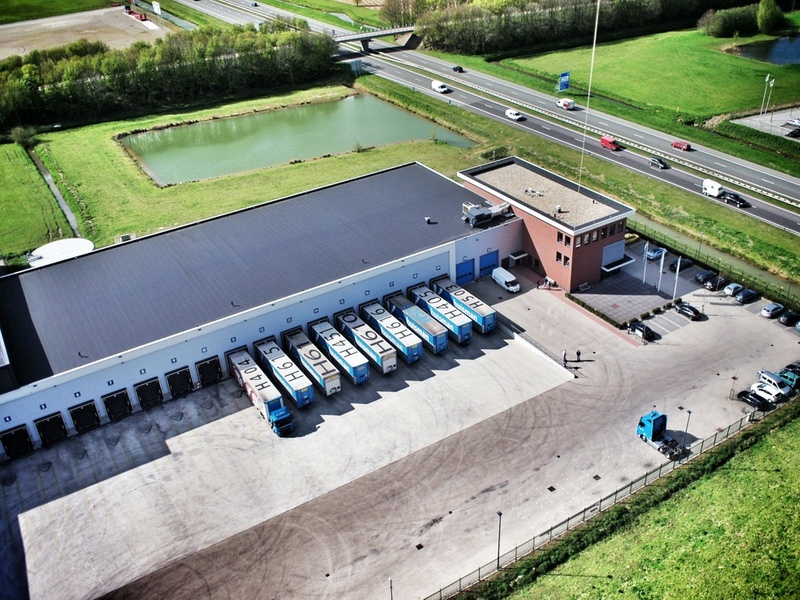 And this is a way further down the road, near Nijmegen, where I spend a lot of my week gathering tokens that I can swap for kiting and camera equipment! Just bought a new 7ft delta that I’d like to try in stronger winds. But it’s chucking it down outside right now. Maybe, just maybe there’ll be a window in the weather later this afternoon. 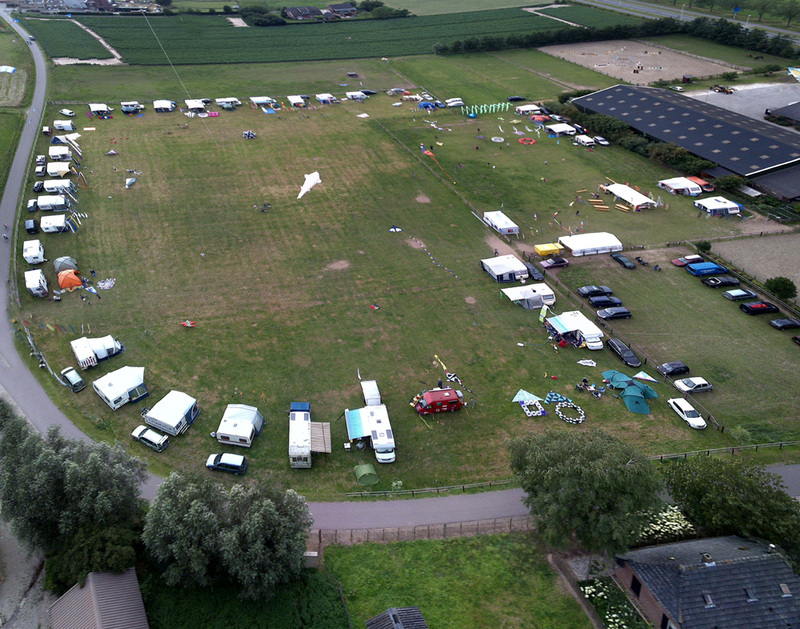 The Free Fun Flyers, from Gemert, NL put on their annual Kite festival last weekend. Weather was rubbish, low winds and showers on the Saturday, heavy rain on the Sunday. 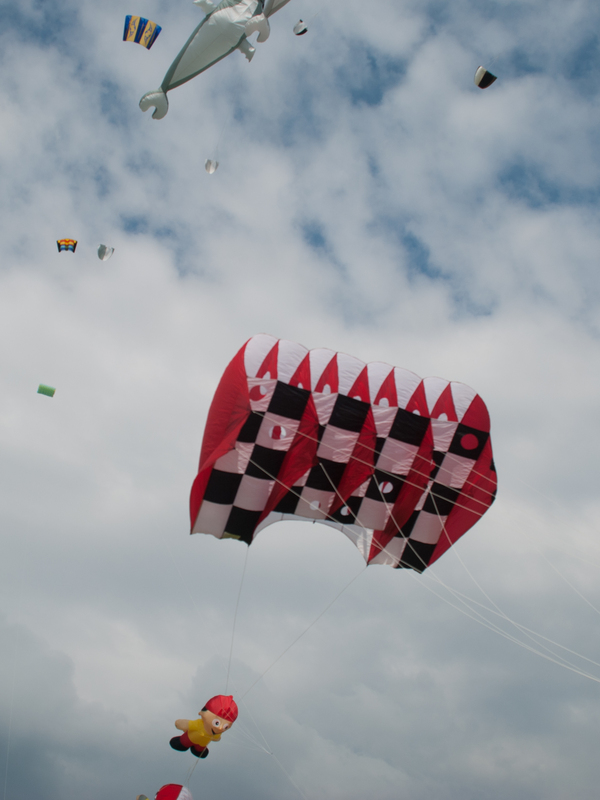 We went down there, got a couple of kites into the air, got wet and watched a demonstration by the 4-man kite team “Air-4-ce”. 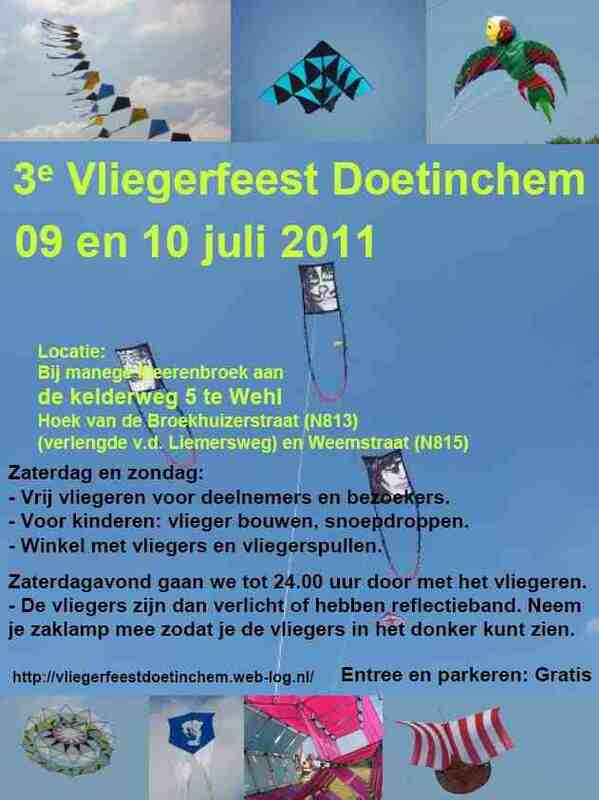 This weekend, just down the road from me in a field outside Wehl, the Doetinchem Kite-festival 2011 was held. Of course, I had to go along to that! I met Cees Kuppens! One of the best KAPers in NL! Out in the field there were dozens of camper-vans, caravans, large tents. 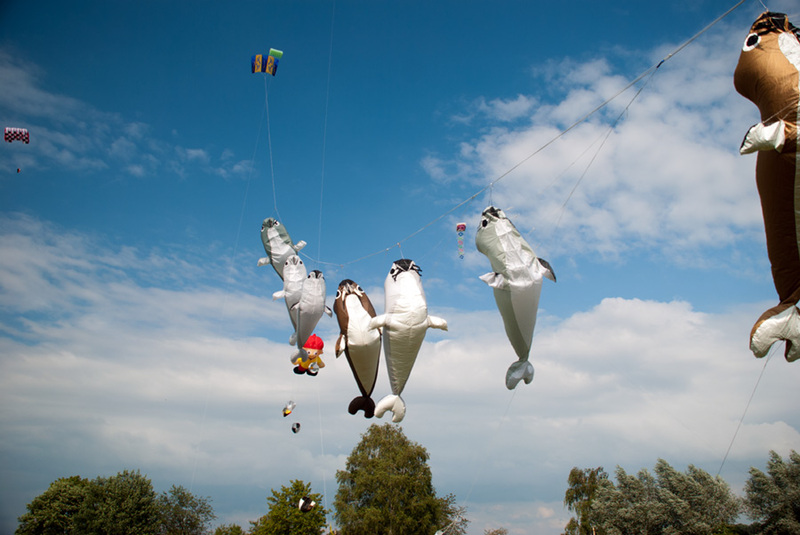 These guys take their kite-flying seriously! Actually it’s really nice, like camping with a common-cause. A bunch of like-minded people, all extremely nice and friendly, setting up camp in a field, hoisting a kite into the air, staking it to the ground, pulling up a folding chair and just chillin’ for the weekend. 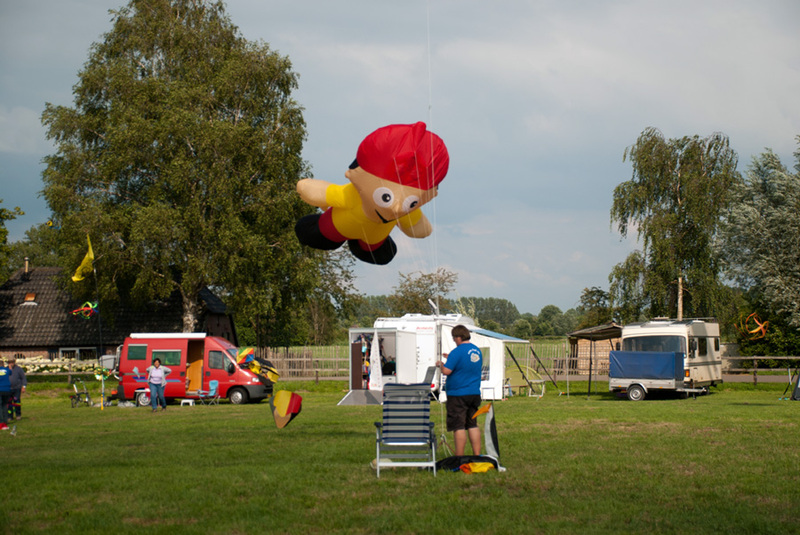 Some had trailers, fitted out with racks and shelves full of kite-building stuff, a travelling workshop really. 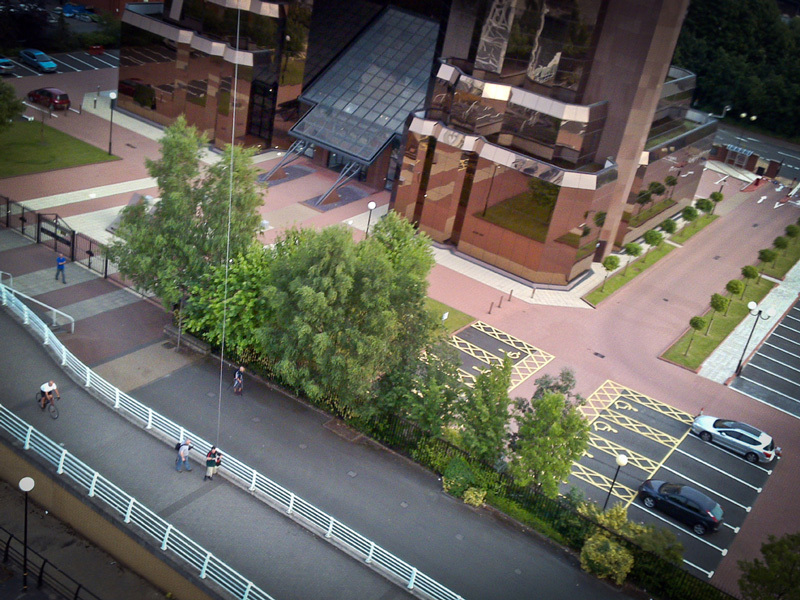 This image is a 5-shot composite image, taken with the N96 under the 6,5ft Rokkaku. A couple of stall-holders selling all-things-kite set up there too, some really interesting stuff there. Quite a busy sky! This one feller had a whole string of Seals, a big Walrus-like thing at the top, going smaller and smaller down to little white baby seals at the bottom. So I got stuck into the fray there, elbowed my way into a reasonably clear bit of sky and staked my claim. The wind was pretty much perfect, 3bft and constant, no scary surprises, so I attached the rig & Pen to the line and sent it up. Just a question of keeping alert as to what the other lines were doing, walk off to one side or the other if they got too close. No multi-liners in this field, they have a section of their own. Pictures were ok, 1000/sec shutter priority set, all nice & sharp. only the 17mm lens on the Pen really isn’t wide enough. I only captured bits of the show-ground, never the whole thing, even at max height. I’ll try stitching a few of them together and see if I can get a decent panorama from them. Some great line-laundry out there too. 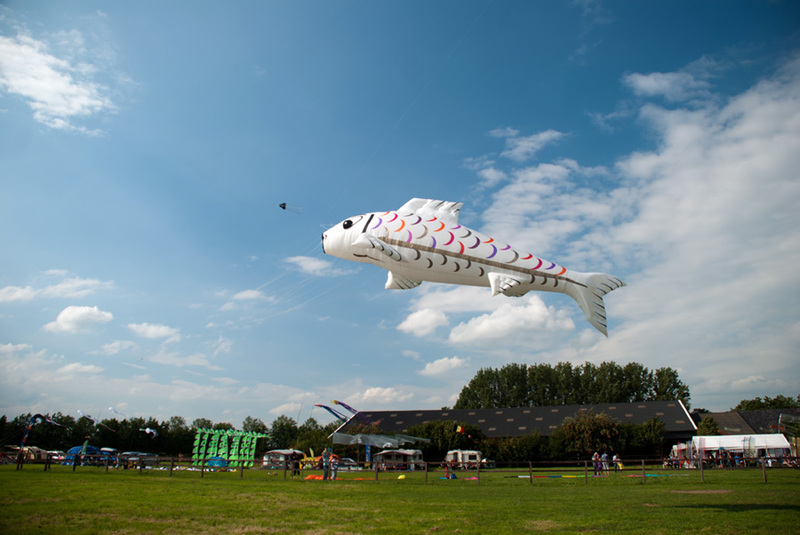 This huge fish is hanging on a line that is suspended by a carrier-kite, way higher up in the air. And I made a film! Sent the N96 back up there under the Rok set to “movie”. I wasn’t expecting much, to tell the truth. I imagined it getting shaken about so much up there that watching a video of it would make you sea-sick. I edited it down from 17mins to just 6, cutting out any really shaky bits and adding a music track. 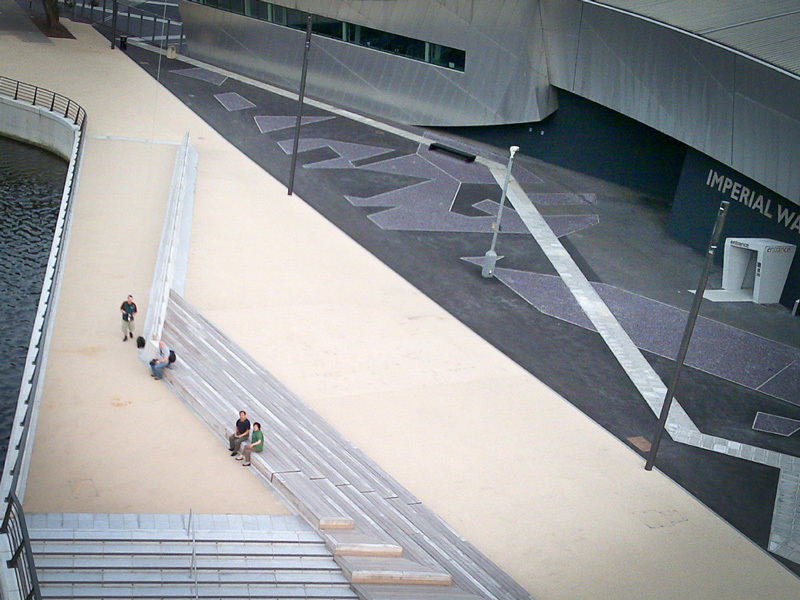 Last night I went over to the newly developed Salford Quays with a mate of mine who’s from the area. 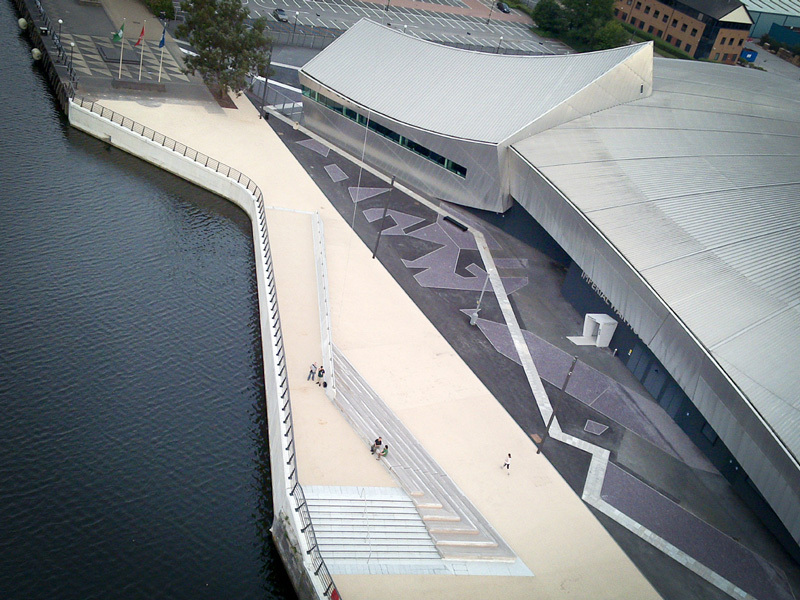 Down near the Lowry centre, the Imperial War Museum of the North and where the BBC has set up camp. Better a lo-tech solution with lesser quality images than nothing at all, right? Actually the launch went quite well, there’s a lot of open water around there and a bit of a breeze was being concentrated, channelled, between the high buildings so we managed to get the Rokkaku airborne and attach the camera, shooting straight back down the line so wherever I was standing would (roughly) be where the camera was taking it’s shots (on a 10 second intervalometer). Getting quite a few admiring and inquiring looks from bystanders around there. Then a camera-club turned up, dozens of them, and I ended up explaining about eight separate times what it was all about. I should get information flyers printed! So here’s one of the Imperial War Museum of the North, an impressive ultra-modern building made of, what looks like, stainless steel. There’s an even more impressive pyramid-shaped tower just to the right, out of shot that makes me want to return with a better set-up, something with a bit more control, but I’m here fairly often so that should happen, on a day with a bit more wind. 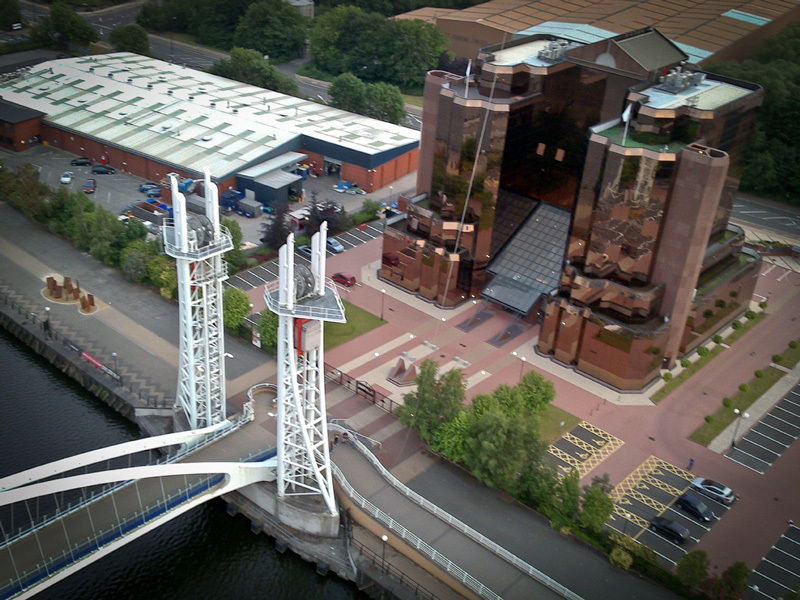 A little further up the Quay is this copper-mirror clad building and a pretty unique lifter foot-bridge. By walking along to where I wanted to be photographed the camera just kept shooting straight down the line to where I was standing and therefore the subject I wanted in shot. It’s a pity I couldn’t cross that bridge, some good stuff on the other side of the Quay, but manoeuvring the line between those towers would have been a bit of a trick, and even then I’d only get halfway across before it closes in above. Could always climb over the arches though, hey, maybe an idea for next time. There are security cameras, on high posts, dotted about all over that area, we would hear a noise, look up and they were tracking us as we went about our perfectly normal activities. Well, all in all a successful KAP outing, good to see my mate Anthony again. Pity there wasn’t much wind but I think we made do. The evening sun was a bit of a let-down too. when there’s a bit of a sunset-show going on that copper-clad building really shines. I’ll be back for more in the near future, no doubt. Can anyone recommend a lightweight “point & shoot” pocket camera with a decent picture quality that has an intervalometer built in? I go through Hoek van Holland probably 100 times per year, across to Harwich, or back from the UK. I knew there’d be a great KAP opportunity from nearby there so this Sunday I went an hour earlier so as to have time to give it a go. 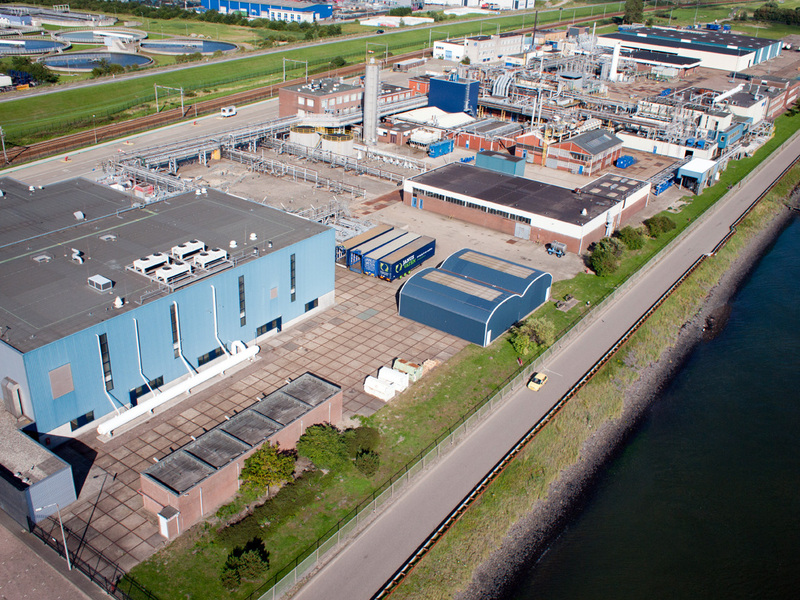 There’s a good example of the Netherland’s “water management” expertise just a little way up the river from the docks. It would look great from the air, I thought. 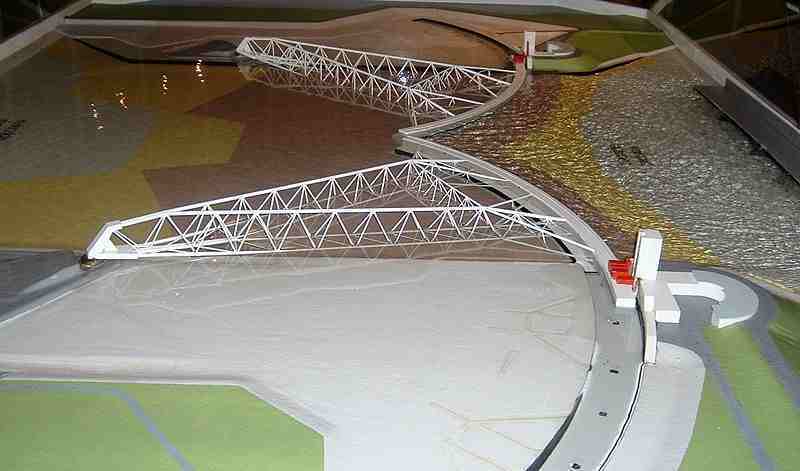 It’s called the “Maeslantkering” and would protect the Port of Rotterdam if there was a storm-surge. So, I got there early, great winds that afternoon for the Flow-form, flew straight from the hand and sat stable at 15m waiting for me to attach the rig. 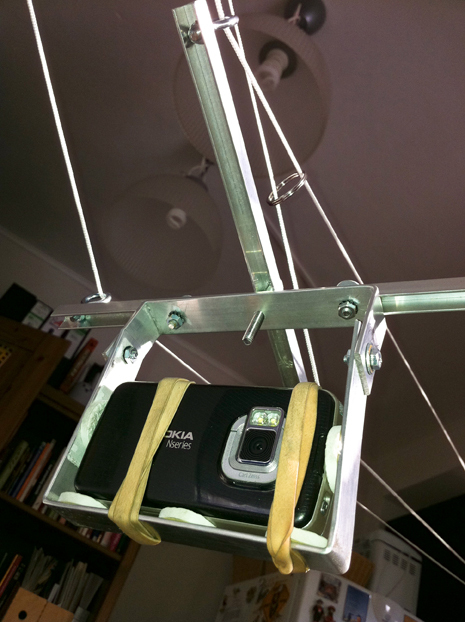 And up it went, no problems, all the way out to 150m of line, at a 45 – 60 degree angle, so what’s that? about 60 – 80 meters off the deck? Perfect. 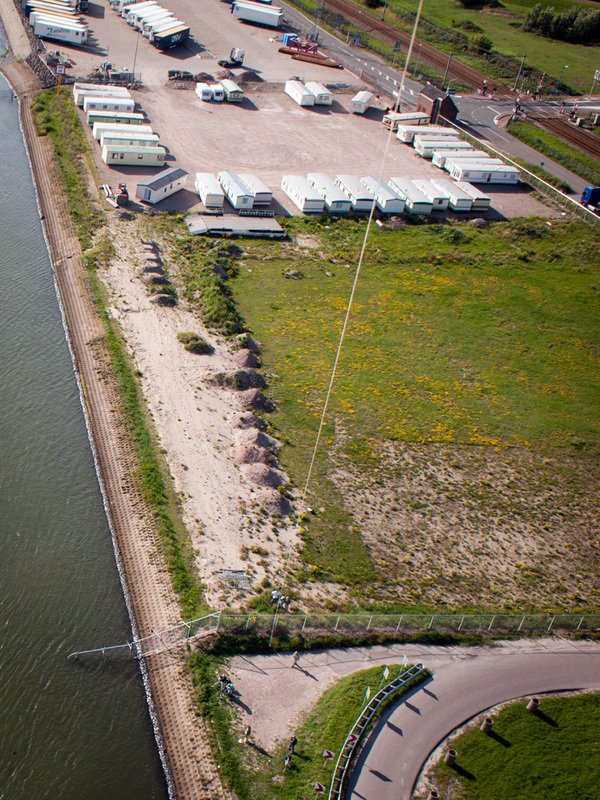 The wind direction too, putting the kite & rig out over the water and down towards the storm – surge barrier. 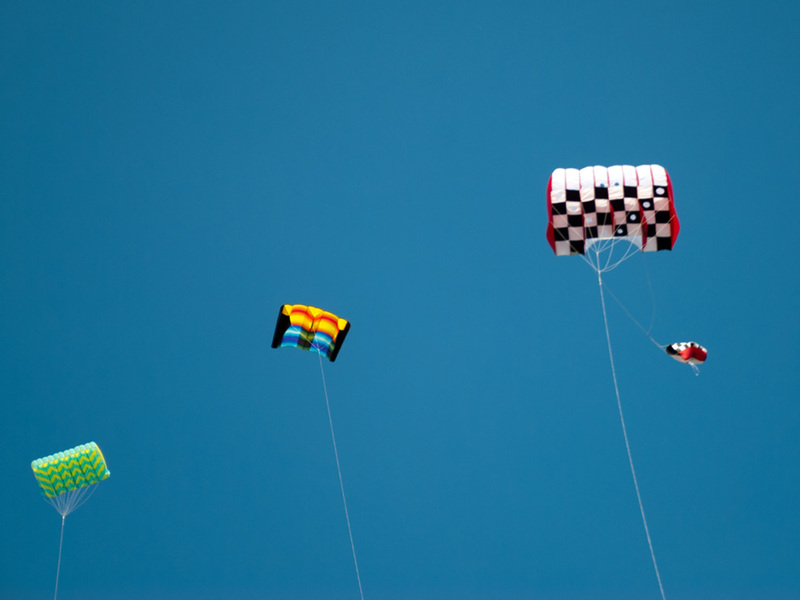 I was joined by a couple of colleagues who’d seen the kite high in the sky and guessed it was me, up to something daft again. While we were stood there waiting for the rig to do its thing an old feller from the other side of the fence asked me if I too was waiting for the historic Holland-America line ship to come past. I knew nothing about it. Apparently it’s the 40th anniversary of these great cruise ships crossing to New York and today one of the originals will leave Rotterdam bound for NYC, just like in the old days. Well, there’s a bonus, I thought! So, the camera’s up there, clicking away, rotating, tilting, doing its thing nicely, and along comes this bloody great cruise-liner, not 50m from where we’re standing, people on the open aft-deck cheering and waving at us. And the camera’s up there doing a great job of photographing the surroundings. 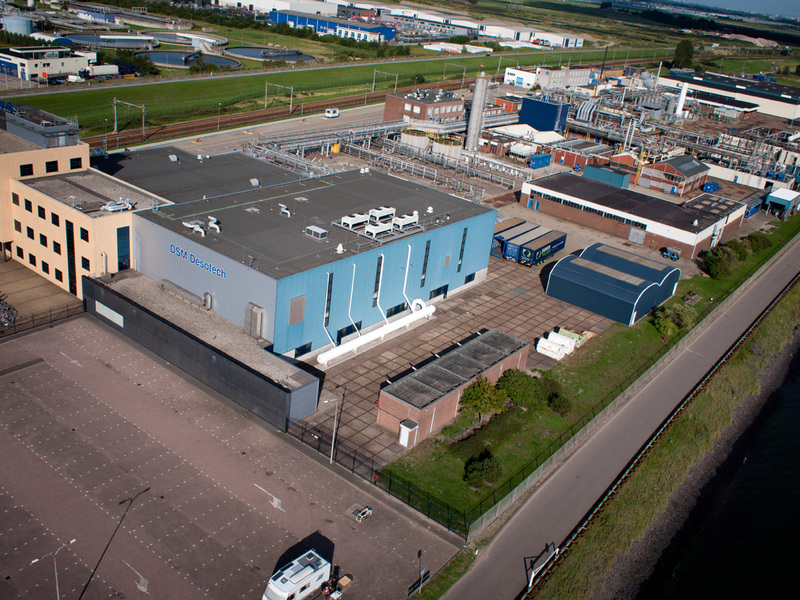 The DSM chemical works next door. 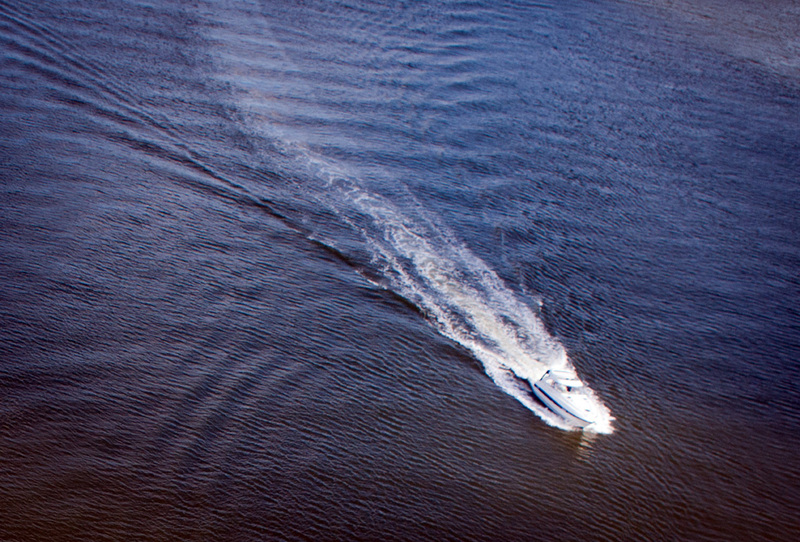 The odd passing motor cruiser. Remember, this is all automatic, settings fixed from the ground before launch, 0,5 secs rotate – picture, 20 degree tilt – picture, 45 degree tilt – picture, rotate – picture, and so on until the batteries die or the SD card is full, or I’ve had enough and bring it back down. So, there I am, happy as Larry, anticipating great shots of the storm barrier and the added bonus of a massive cruise liner from close-up and above. 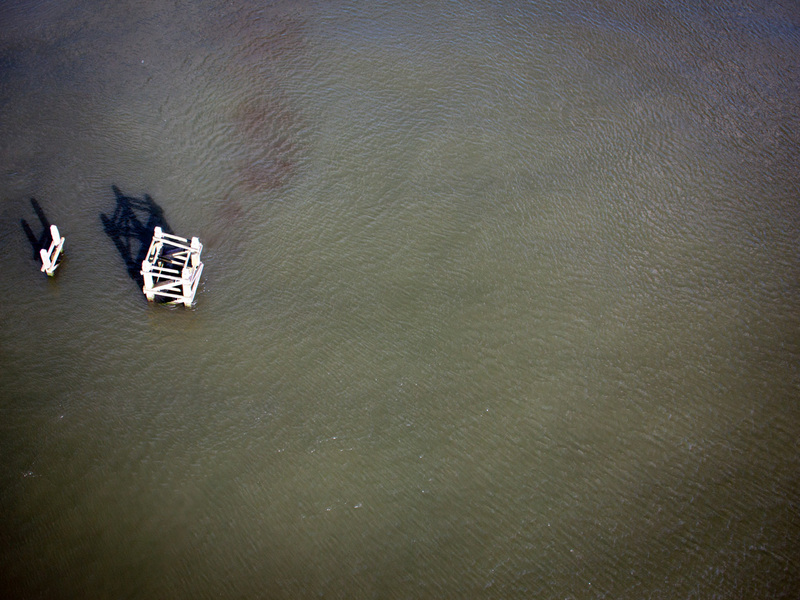 I bring the rig down, after the ship has passed and is out to sea. 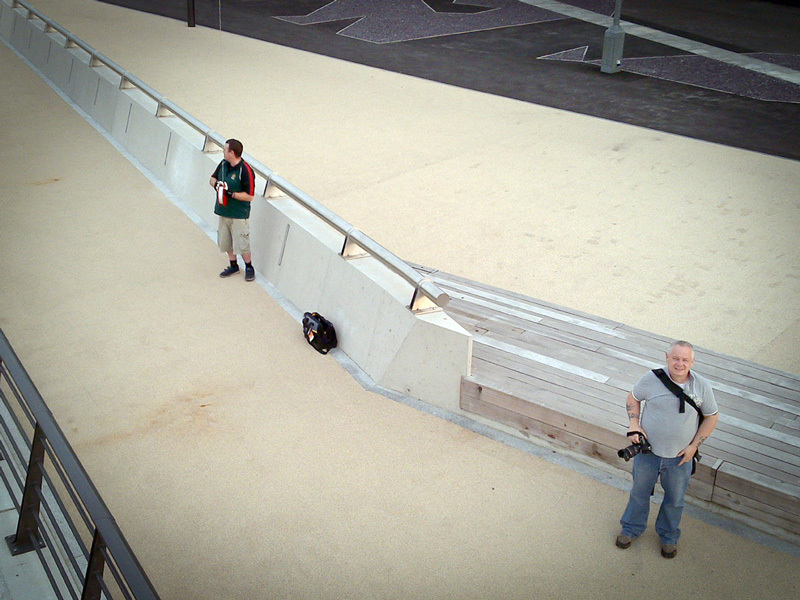 Check out the images on the back of the camera, my two colleagues looking over my should and, have you guessed yet? A cruise ship, as big as two apartment buildings passes by just a few meters from my fully functioning, automated, rig and the bloody thing’s looking the other way as she went by!! Taking lovely shots of some scabby chemical works in the other direction!! And no sign of the storm barrier either! initial angle of shot was 20 degrees, too low for where the subject was! 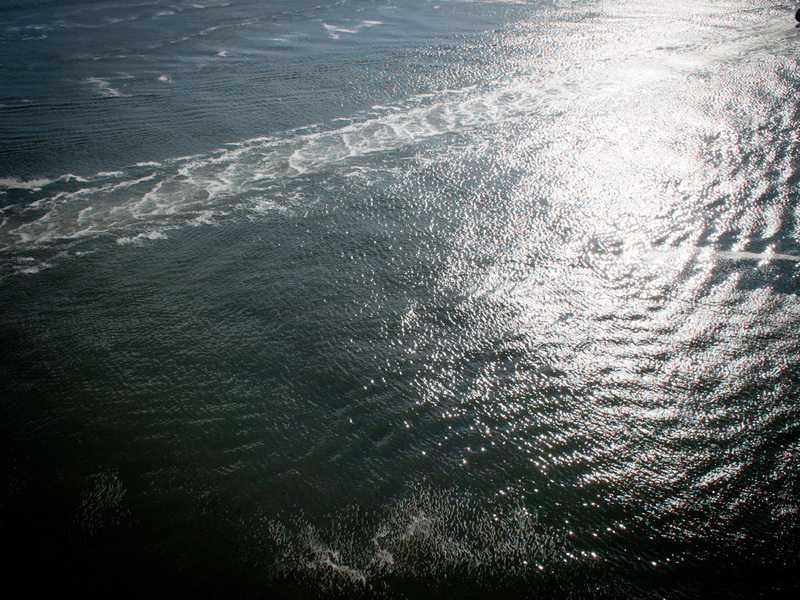 This shot was the nearest I came to getting a shot of the cruise ship, its wake as it passed. Time for a remote control set-up and a video link I think. Not a totally wasted session, I now know exactly where to go next time and I’m here very often. 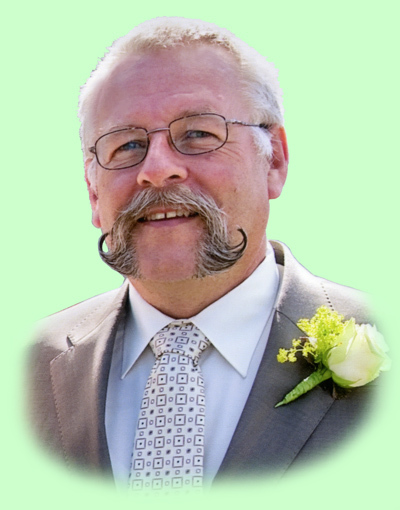 Now, where’s that KAP-shop website again . . . . Peter! I need more stuff!
. . . . . is a windmill! 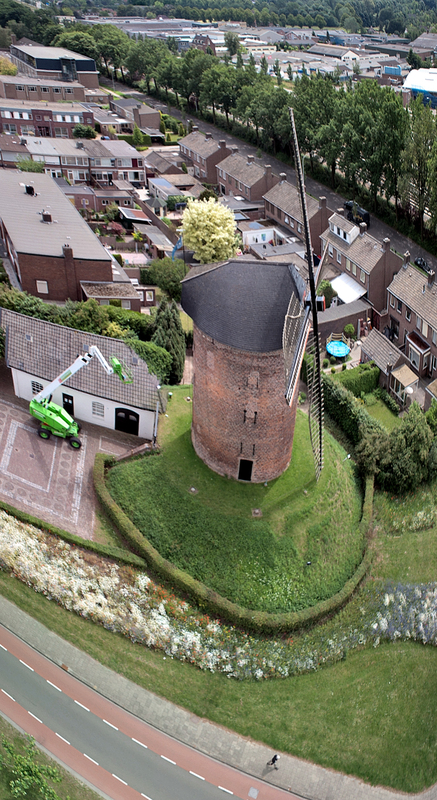 Not just any old windmill but the “Buitenmolen” is the second oldest windmill in The Netherlands. 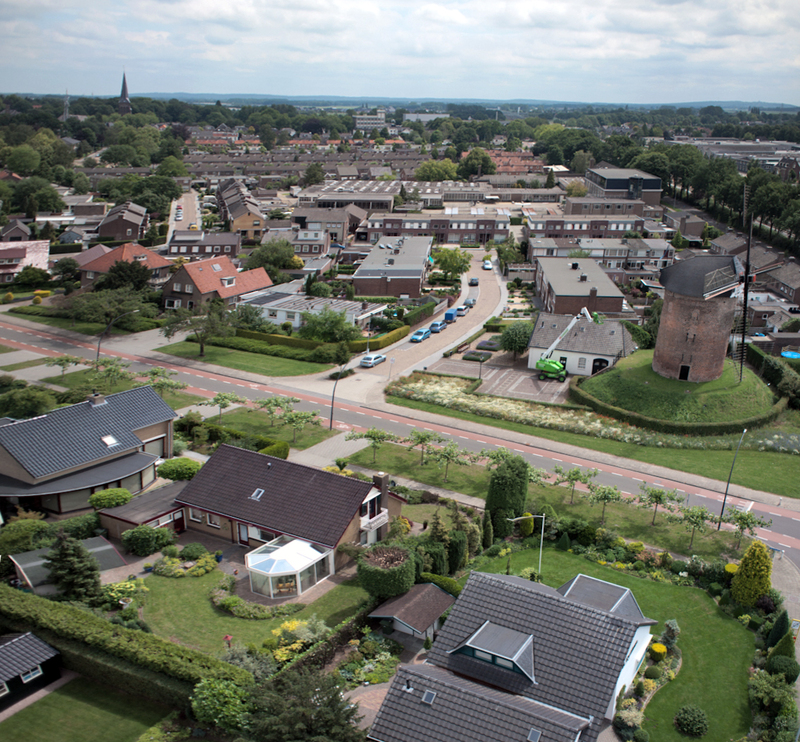 The oldest is in the neighbouring town of Zeddam. It was built between 1440 and 1450. I started with the Rok but it wasn’t behaving itself too well, even with a drogue added (which helped lateral stability enormously) I didn’t trust it not to dump my camera & rig into someone’s back garden. More experience with the 6’5ft crocodile necessary I think, or just save it for lesser winds and develop a lighter rig/camera to go with it. The Foil worked great, near perfect winds, if a little scary in the gusts. As you can see it’s situation isn’t exactly ideal for flying a kite – there’s a busy international rail route behind me, tall trees next to that, buildings, gardens, a major crossroads, but luckily – a quite large car-park next door (empty on this bank holiday Monday) and the wind (4bft) coming in from over the rail line so no danger there. Got some great views into some neighbour’s back gardens. The church-spire in the distance is right in the centre of town, one day, when the wind’s blowing straight down the highstreet I’ll KAP that too! 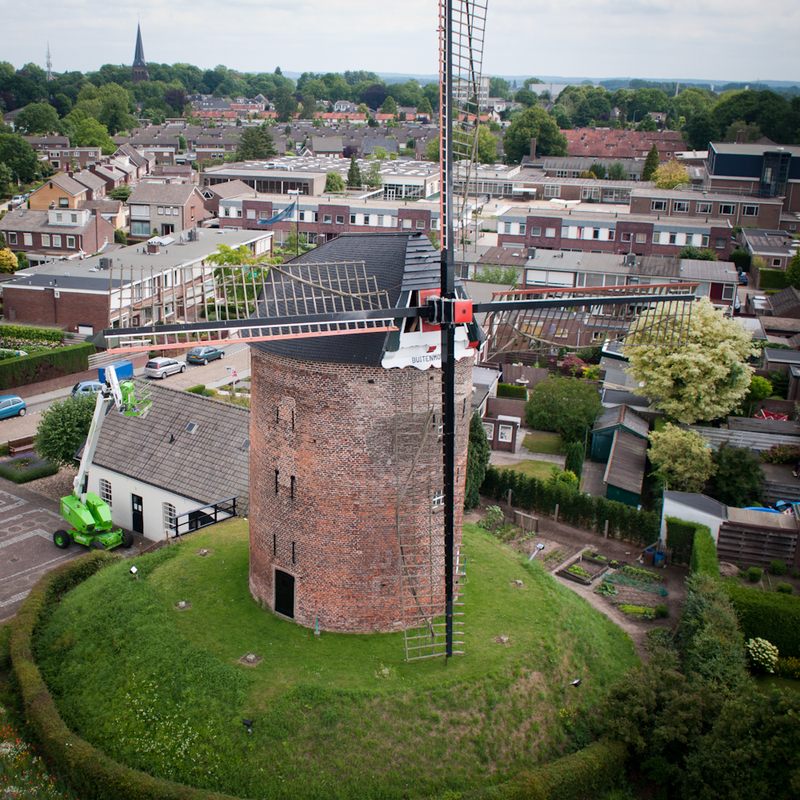 So there you are – De Buitenmolen, Zevenaar, 100m from my front door.